Storm Desmond was a disaster nobody in Cumbria will ever forget, bringing unprecedented floods that left homes and businesses underwater, and roads and bridges destroyed. 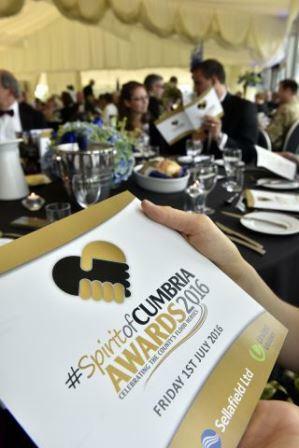 But it is thanks to an incredible spirit – the Spirit of Cumbria – that communities are now bouncing back stronger, with some of the county’s most inspirational people leading the way.CN Group’s Spirit of Cumbria Awards 2016 aimed to recognise the county’s flood heroes – those who went above and beyond to help their neighbours, communities and often complete strangers.Held on Friday night at Garden at Eden, near Carlisle, it was a chance to say thank you to all those who helped and give special recognition to 14 winners, selected from over 250 nominations. Some saved lives, others rallied round to help their communities and the flood victims whose lives were in turmoil. Cumbrian MP and Floods Minister Rory Stewart, guest speaker at the ceremony, talked about the night of the floods and the next day, as the true scale of the disaster hit home.But he said what always stood out the most were the people. “It was a night, a week, a month, a six-month period that should make us deeply proud of our county,” he added.Helen Fisher, of main sponsor Sellafield and one of the judges, said the event was about both individual heroes and the wider Spirit of Cumbria. “There are so many fantastic stories. I’m really pleased that we can honour some of those people here tonight,” she added. Despite their inspiring work, all of the winners used the same word to describe how they felt to be called flood heroes – humbled.Award winner Kerryanne Wilde, of Eden Flood Volunteers, summed it up. “It’s not just about me. There is a whole team behind me. Without them none of this would be possible,” she said.But Allerdale council leader Alan Smith, who was one of the judges, said it was he who felt humbled. “I have great admiration for the community spirit shown by those in this room,” he added. Share the post "Cumbria’s flood community heroes honoured"